Somato Emotional Release helps rid the mind and body of the residual effects of physical and emotional traumas. 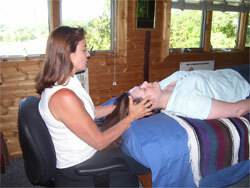 This therapy focuses on wholeness and self-healing through a mind and body approach. The therapist works with the patient to encourage the expression and release of surpressed emotion within a safe environment. Energy cysts are localized energy with in the body left there by past physical or emotional traumas that have occurred in one's life. Through dialogue and gentle CranioSacral techniques the Therapist assists the patient with the processing of releases. Positive benefits of therapy include relief of stress and tension related problems. Benefits also include reduced emotional difficulties, post-traumatic stress disorder, relief of body pain that is emotionally based, phobias, low self esteem and depression.